This is another color scheme works every time. Green and purple go together beautifully. I didn’t use much of saturated colors in this painting, but it makes me excited. I changed my background color today. Generally speaking, I prefer dark background so I can have my center of focus have a light show. But I had too many of that. So I sometime do dark center on a lighter background. I have not got a kick of this approach. I feel the painting looks more conventional this way. What do you think? Please talk me into it or out of it. We will see who wins. I got this cute little vase the other day. 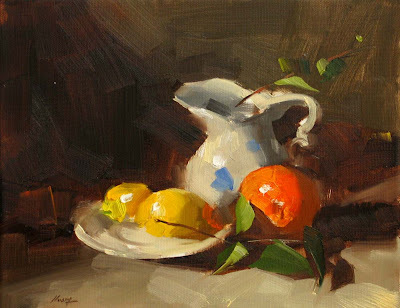 The piece of blue color in the design gives great color contrast to the lemon. You can see that I am still testing color schemes for the center of focus. For yellows I have not get the effects I really want. I will keep trying. 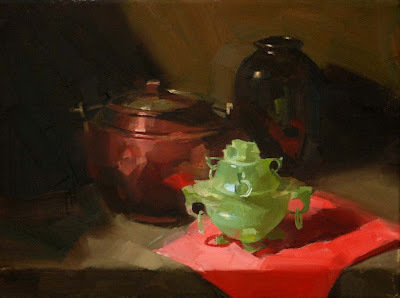 Since I am in the mood of painting jade, I did this gallery painting yesterday. I got a nice looking copper thingy recently. It is so great to place these two objects together to show the texture difference. 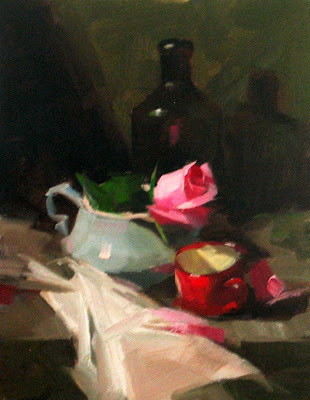 Oil painting has this incredible potential that you can represent tremendous amount of subtlety. I love it more and more. I got this jade cup when I was in Beijing. The cool translucent color of this gem made me so excited to paint it. Many people like my paintings with the vibrant red color. I do too. But I also keep searching and experimenting with other colors to provide other kinds of visual enjoyment. Painting this cup is definitely from this constant motivation. 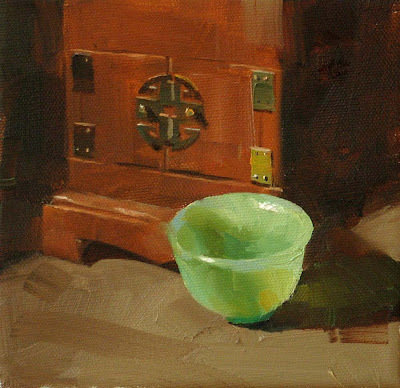 The green colors for the Jade is mixed from phthalo blue into various kinds of yellows. I hope you can visually touch this cub and enjoy its smoothness and translucency. This is my second demo at Granbury. Sorry about the blurry on the photo. I didn’t get to use a tripod for this long exposure shot. However, you got the idea. With this demo, I got everybody excited for doing roses. It was very hard at the beginning, but if you don’t give up and keep practicing. It will get easier and easier. I came to Granbury TX, a beautiful small town 25 miles west of Ft. Worth. 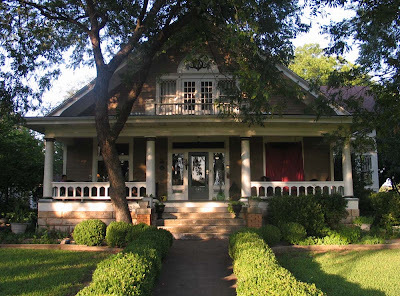 I am giving a painting workshop at the legendary Iron Horse Inn. This great house was built in 1905. The owner of the house Theresa has told us dramatic stories about this house. If you want to know what happened here, please check: http://www.theironhorseinn.com/retreat.htm and contact Theresa. This painting is very similar to the one of my last post, but I went back to canvas again. I don't mean to confuse you. I really like the Masonite board better, but I have a pile of canvases not being used. So you will still see I paint on canvas a lot in the future. My general attitude toward painting materials is that: "Do not let the material issues restricting your art". I am constantly being asked what kinds or brands paint, brushes, media, and canvases I use. I provide answers according to what I use at that moment, but I may change at the next moment. 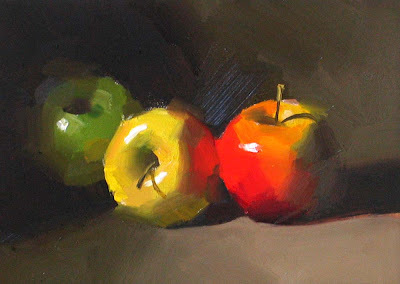 There is no double that the property of paint and brushes play a very important part in a painting process. However, the artist him/herself is the one who determines if a painting works or not. I think I am back to my regular painting mode again, and I also started to explore new methods. I did this painting on a gessoed Masonite board. The reason I shifted away from canvas is that I realized that I can create more painterly effects with less paint. 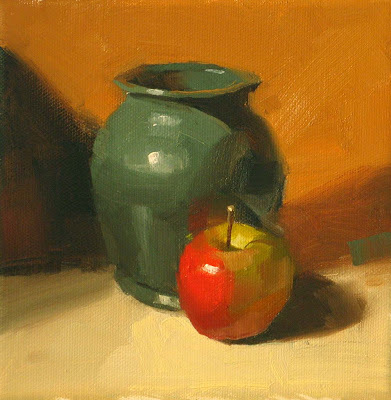 When I am not sure about a mix of color, I test it by mixing a small quantity with my brush, I found using Masonite is relatively easier to get an effect. But on a canvas, I need much more paint. 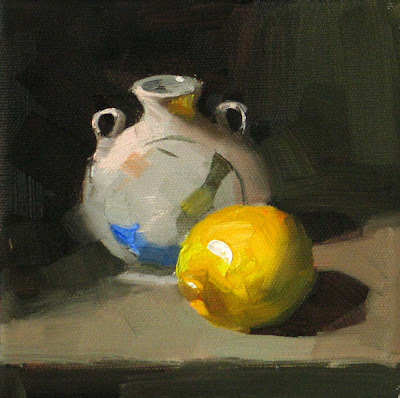 That could be the reason that I have hardly seen that David Leffel using canvases. 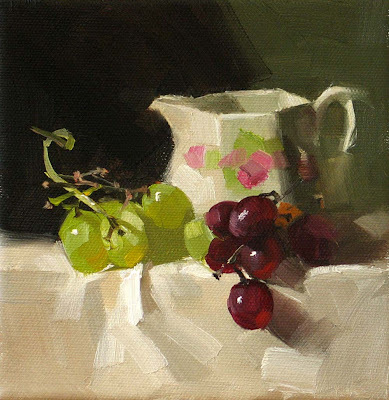 My workshop at Granbury TX is coming up this week. I want to make sure I still can demo in front my students. This 9" x 12" has my usual style. 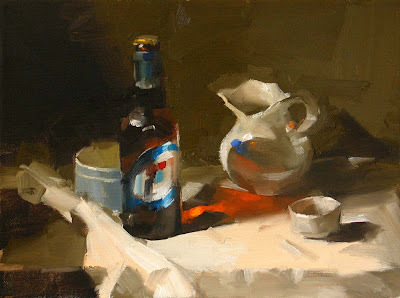 During the setup phase I really got excited by the orange light transmitted through my only bottle of Miller Lite. It took me about two hours to figure out this setup. It turned out better than I expected. Now I am more confident and ready to teach again. Today, I want to share with you a painting that is not done by me. It was done by my uncle more than Thirty years ago. My uncle – Hongen Huang was a high school art teacher. Thirty some years ago when I was in middle school, I lived with my grandma in Beijing, China. My uncle lived in another city very far away. Every summer, uncle Hongen visited us, and he painted en plein air landscapes everywhere he went. Since he was not local, I volunteer to be his tour guide. We went to many wonderful places. He painted and I watched. It was very enjoyable watching uncle Hongen painting. Many brush strokes I use today actually belong to him. Uncle Hongen is the artist influencing me more than any artists did. This time I went back to Beijing and brought this painting with me to America. I have not painted these several days. 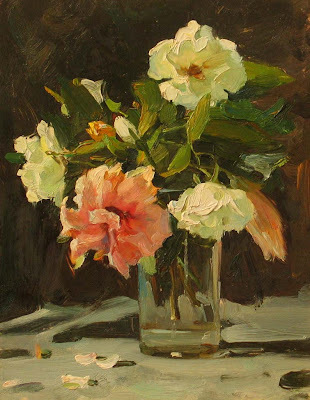 My jet lag turns me into vegetable in the hours I used to paint. I still wake up in the middle of the night for quite a long time. Consider I have to go to work during my daytime hours; I don’t want to get too excited during the night. I have to wait patiently for my painting chances to come. 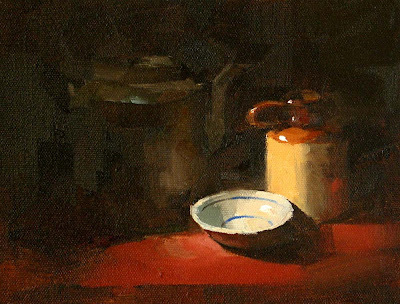 Painting light is my main motivation when I approach to a still life painting. This one is a good example. Vast amount of darkness enhances a small area of light. Subtle value change in shadow gives more dynamic range to the light. I didn’t use much of vibrant colors for this one, but I really enjoy the dances performed by the values. During my China trip and the week after I came back. I have received massive amount of emails. I am really touched by all your warm words. I wish I could reply to each of you, but unfortunately I am not able to do that any more. I want you to know that I deeply appreciate your support and hope you to understand my lack of resources to manage all emails at one-to-one basis. I think the best way to feed back to you is to constantly improve my art and bring you some happiness visually. Thank you very very much. 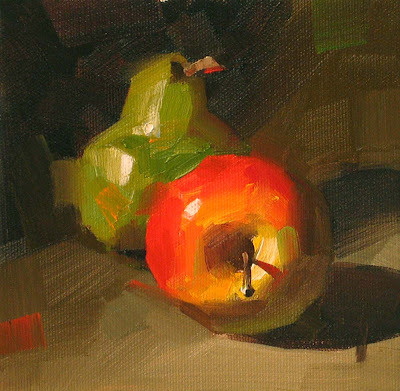 It has been the longest break time to me for being not painting since I started as a so-called “daily painter”. It has been dangerously long that makes me wondering if I still know how to paint. I have to challenge this negative momentum, and now I am back. I am still in the warm up stage, but I am back. Still with my jet lag, I did this painting from 1:00 to 4:00 AM this morning. This one is from a photo I took in Beijing. 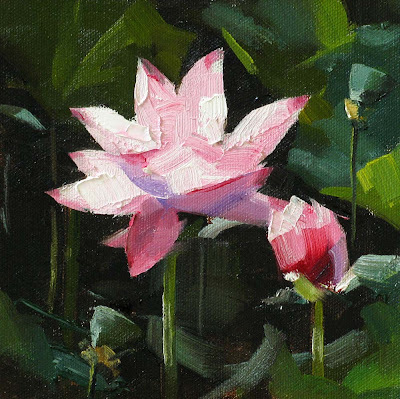 Lotus flower symbolizes effort out of a difficult situation relentlessly to achieve perfection. It sounds like a daily painter’s spirit.